Are you an aspiring guitar player looking to add a little "allergy music" to your repertoire? 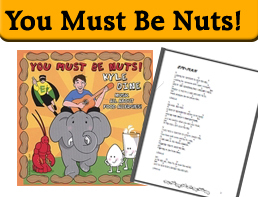 Kyle's songs are enjoyable to play on guitar whether you are a beginner or a seasoned pro. "I Wrote a Song about Allergies" is the best song to start with if you are a beginner. For more of a challenge, take a shot at "Smellephant the Allergic Elephant" or "The Doghouse". Keep on rockin'!